This car bears a resemblance to Larry Wood's truck. It is noted for having a fold-out ramp that cars can be put on. It also appeared in Hot Wheels: Velocity X as an Unplayable Car at Turbine Sands. 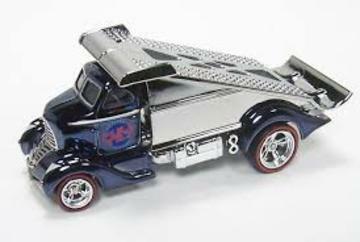 In 2012 Mattel released that this Cabbin' Fever was actually retooled for production reasons and released the orginal version in HotWheelsCollectors.com Series 11.